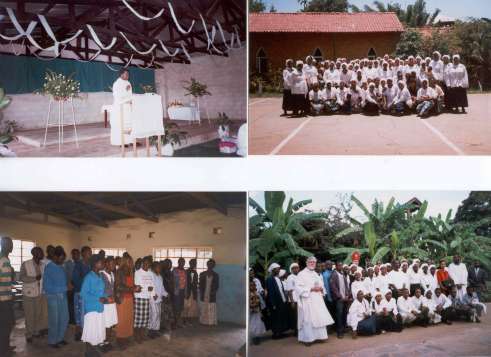 The motivation for setting up Makeni Ecumenical Centre was a Christian one – Jesus Christ Himself had set the example of combining spiritual teaching with good works of healing and caring for those suffer. It is therefore not surprising that from day one of the Centre’s opening, in September 1971, Christian worship and teaching commenced alongside its community services. The first classroom to be finished became the venue for ecumenical Sunday Services. It was hoped that the deeply ingrained denominational differences in Zambia could be set aside, and that an interdenominational worship would be supported by all Christians in the Makeni area. Makeni had only one or two churches in those days. The services had an “Anglican” dimension simply because the priest and founder of the Centre was an Anglican. Interdenominational worship in the “Holland Hall” lasted for twelve years. Towards the latter part of those years, the Roman Catholics were the first ones to leave and build a church next to the Centre. Then the Baptists and Presbyterians in the congregation begged to be given classrooms to worship separately. The reason given was language. The history of the coming of Christianity into Zambia is a tribal one: each denomination selected a tribal area to spread the Gospel. Therefore now each denomination has a language preference. By 1983 an attractive church building was erected with funds raised locally. It can seat about two hundred people at a squeeze. Its roof was thatched and soon leaking like a sieve …. Many years later the roof was tiled. The building was offered for use to each congregation in the Centre; however, the desire on everyone’s part to worship at the same hour on Sunday morning meant that only the Anglicans used it, since they paid for it. Many years later, the Reformed Church of Zambia was also allocated a classroom for worship in the Centre. The ecumenical ideal has only partially succeeded, with four congregations meeting for worship separately each Sunday. The Anglican congregation now has about 150 members, the Presbyterians about 60, Baptists about 120 and Reformed about 60 members. Many other denominations have also asked for places to worship, but the MEC management felt that there was enough Christian division in the Centre already. Over the past thirty years or so, there has not been one Sunday when there has been no worship. Daily Morning Prayer and Holy Communion services were introduced in the Anglican chapel in MEC some years ago. All congregations have regular catechetical or confirmation classes, and all do pastoral visiting. MEC’s adult students and children have services of worship weekly. Bible Study groups also meet regularly in the Centre and in people’s homes. Because of MEC’s involvement in agricultural settlement and the consequent creation of new settlement villages all the time, Christian worship has been encouraged in all MEC’s settlement villages. The result is that there are congregations of almost all main denominations in the five settlement villages, involving many hundreds of Christians. The Roman Catholic Church built a very nice church in Mwembeshi Settlement Village, which they allow the Anglicans to use as well on occasions when their bishop visits. In AD2000 the Centre provided a classroom, office and seminarians’ residence for training of priests of the Anglican Communion. The Centre is planning to set up a new project in 2003: the Makeni Bible Training Institute for Church Leadership. It aims to train prospective lay church leaders of any main denomination in a wide range of Christian study subjects. MEC is looking for qualified volunteer teachers to assist in this new project and invites applications from such volunteers. We thank God for enabling us to promote His Kingdom through the Centre and for the many people who have come to love and serve Jesus Christ over the decades of MEC’s existence. Fr Mukuyamba in the new Chunga church building on the day of its consecration. Fr Mukuyamba and his wife Prudence play a vital role in God’s work in the townships and rural areas. A group of newly inducted members of the Women’s Fellowship pose in front of Makeni church. The Women’s Fellowship takes its spiritual duties very seriously and the women are expected to build up God’s kingdom in their homes and in their society. The Praise Team sing Gospel songs in the classroom used by Lilanda congregation for its church services. This large congregation spills over into the grounds outside every Sunday – the room is just too small. The Lilanda congregation is keen to build its own church – cost US$15000. Annual income of the average Zambian family US$250…. A group of newly confirmed folk pose with the bishop after the confirmation service. Every year hundreds of people are added to the numbers of God’s elect in the Lusaka region. Church growth is excellent and confirmation services are always occasions of much celebrating, singing, dancing and eating!